The picture above provides a quick overview, from left to right you get to see: 1) Front cover, 2) The introduction and content pages, 3) A sample walk and 4) A collection of Islay walking pictures. The booklet contains 25 walks for all levels of experience, from short strolls to a beach to several hours long walks over rough ground. 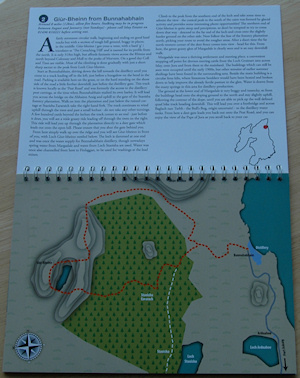 For each walk you get a double page spread, one page with a walk description and one with a high level map. The picture on the left shows the description for the Giùr-bheinn Walk from Bunnahabhain. The overview map with the red dot shows the general location of the walk. The walk descriptions vary in length, depending on the type of walk and complexity. While not overly detailed I feel the information is always sufficient to complete the walks, in any case the booklet (and I) recommend to always have the necessary OS map to hand (I recommend OS Explorer Map ‘Islay North’ and OS Explorer Map ‘Islay South’ depending on the area). Not to forget the right footwear and other appropriate equipment of course. Several of the walk descriptions have been been written by Lindy MacLellan, who provided more than just plain directions. There's quite a bit of background information, historic information, explanation of names and the like, also suggestions which wildlife to look out for. There's also a reference to the Outdoor Access Code in the booklet, something I believe to be quite important as I've written before in Islay and the Outdoor Access Code. If you go walking on Islay, with or without this booklet, please keep it in mind. In summary, as you've probably gathered already, I very much like this booklet. If you're interested in walking on Islay I recommend getting it (not sure how much they will be), it will be available from the Tourist Office in Bowmore and various outlets around Islay. Disclosure: Several of my pictures were used in the booklet (incl the front and back covers) under a general permission the marketing group has to use my pictures. However, I don't make any financial gains from the booklet and wasn't involved in the production at all.